A short Amazon review I wrote for "These Days," 'B' side of "Love Will Tear Us Apart." 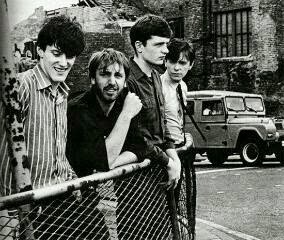 Joy Division blew me away in my mid teens. I bought everything they created that was available to me in trouble plagued Northern Ireland. Their contrariness and outsider image- the starkness of some sounds mixed with stark images of the band and sleeve designs, - contrasted with the richness of melody and emotion of other tracks, reflected the working class "loaded gun won't set you free" hopelessness but resilience of my community and society. These Days is a hugely under-rated and under-radio played piece of post-industrial rock. Ian Curtis' voice pierces like some sort of almost Dalek like future shock robotic tannoy. The record could, as it almost sets out to do, have developed into a piece of electronica, but instead has some of Joy Division's most memorable riffs and a really sublime mix of keyboard, guitar, drum and bass (Joy Division and New Order were drum, bass and melody with some of the best production in British post punk/"brit-pop"/Northern England industrial dance history). If you want to know what Joy Division were, download These Days, Atmosphere, New Dawn Fades and Love Will Tear Us Apart and then enjoy filling the gaps later.